We report on GATA3 analysis and the phenotypic spectrum in nine Japanese families with the HDR syndrome (hypoparathyroidism, sensorineuraldeafness, andrenal dysplasia) (MIM 146255). Fluorescence in situ hybridisation and microsatellite analyses showed heterozygous gross deletions including GATA3 in four families. Sequence analysis showed heterozygous novel mutations in three families: a missense mutation within the first zinc finger domain at exon 4 (T823A, W275R), an unusual mutation at exon 4 (900insAA plus 901insCCT or C901AACCCT) resulting in a premature stop at codon 357 with loss of the second zinc finger domain, and a nonsense mutation at exon 6 (C1099T, R367X). No GATA3 abnormalities were identified in the remaining two families. The triad of HDR syndrome was variably manifested by patients with GATA3 abnormalities. The results suggest that HDR syndrome is primarily caused by GATA3 haploinsufficiency and is associated with a wide phenotypic spectrum. The unique dominantly inherited condition consisting of hypoparathyroidism, sensorineural deafness, and renal dysplasia has been recognised as a distinct clinical entity since the report by Bilous et al 1 (MIM 146255). Hasegawa et al 2 found this condition, which they named with the acronym HDR syndrome, in a Japanese girl with a de novo 10p deletion, suggesting that the gene for this syndrome resides on 10p. Subsequently, molecular deletion analyses have been carried out in several patients with features indicative of HDR syndrome, defining the critical region between D10S189 and D10S226 on 10p14-15, distal to the DiGeorge critical region II.3 4 In this context, GATA3, a transcription factor with two transactivating domains (TA1 and TA2) and two zinc finger domains (ZF1 and ZF2),5 6 has been mapped to distal 10p,7 and human GATA3 expression has been detected in the developing parathyroid glands, inner ears, and kidneys, together with the thymus and central nervous system (CNS).8 9 Van Eschet al 10 performed a positional candidate gene approach, successfully identifying heterozygous GATA3 abnormalities (one nonsense mutation, two intragenic deletions, and two whole gene deletions) in five families with HDR syndrome. However, GATA3 haploinsufficiency has been reported in only five families with a fairly typical HDR phenotype,10 so that the frequency of GATA3 haploinsufficiency and the phenotypic spectrum remain to be determined. Here, we report on further GATA3 analysis in patients with HDR syndrome and discuss clinical features of this syndrome. This study consisted of nine Japanese families (fig 1). In each family, the proband was ascertained because of having the triad of HDR syndrome. Families C, D, and F have been reported elsewhere.2 11 12 For convenience, each person is indicated by a family/pedigree number, for example, the proband of family A is described as case A/II.1. Families A-I analysed in the present study. The proband in each family is indicated by an arrow. The karyotypes of the probands in families A-D are described; the father of family A has a reciprocal 10p;18p translocation. The presence of the HDR triad and other features is indicated by blackening of each quartered area. The asterisks indicate subjects who underwent blood sampling. The black diamonds in family I represent subjects who died in the early neonatal period. The HDR triad features of each patient are summarised in table 1. Hypocalcaemia and/or hypoparathyroidism was indicated in 11 of 13 biochemically examined cases. One case (A/II.1) had asymptomatic neonatal hypocalcaemia and repeated blood samplings after the neonatal period did not detect hypocalcaemia but indicated low serum intact parathyroid hormone (PTH) levels. The remaining 10 cases had afebrile convulsions, irritability, or tetany between 1 month and 72 years of age, and were diagnosed as having hypoparathyroidism with definitely or relatively low intact PTH levels; their serum calcium levels were normalised with 1α(OH) vitamin D therapy. In addition, one case (F/III.1) had a low normal intact PTH level, although there was no discernible hypocalcaemia. Sensorineural deafness was present in nine of 11 cases examined by auditory brainstem response or audiometry. The degree of hearing loss was variable among patients, ranging from mild to profound impairment, and was symmetrical in all cases except for one (F/I.1). In addition, hearing impairment was probable in two cases using hearing aids, and was clinically suspected in two cases with delayed verbal development. Renal lesions were radiologically confirmed or clinically suspected in 13 of 16 cases. Renal aplasia or hypoplasia was shown in five cases by ultrasound or CT scans, pelvicalyceal deformity was found in three cases by intravenous pyelography, vesicoureteral reflux was shown in two cases by voiding cystourethrography, and gross scar was detected in one case by renal scintigraphy. The urinary anomalies were asymmetrical in all but two cases (A/II.1 and D/II.1). Six cases developed chronic renal failure, and five of them were placed on dialysis. One case (G/II.2) had proteinuria and haematuria suggestive of renal dysplasia. Several patients had additional features other than the triad of HDR syndrome (fig 1). Case B/II.4 had pyloric stenosis and underwent Ramstedt pyloromyotomy at 1 month of age. Case C/II.1 had a ventricular septal defect, which closed spontaneously. Case D/II.1 experienced cerebral infarction four times between 7 and 20 months of age. Case I/III.1 had bilateral retinitis pigmentosa and severe short stature (–4.4 SD), which were absent in other family members. Cases I/II.2, I/II.3, I/II.4, and I/III.2 died of unknown cause in the neonatal period. In addition, the probands of families A-D manifested various degrees of growth failure, mental retardation, and multiple congenital minor anomalies. By contrast, immune related disorders were absent in all the patients, and immunological studies showed no definite abnormalities in cases A/II.1, B/II.4, and C/II.1 (table2). After obtaining appropriate consent, blood samples were taken from 12 affected and 16 clinically normal subjects from families A-I indicated by the asterisks in fig 1. Chromosome analysis was performed on 50 lymphocytes with standard G banding. For the probands, high resolution G banding was also carried out with ethidium bromide. The distal 10p region was examined for deletions including GATA3 by fluorescence in situ hybridisation (FISH) and microsatellite analyses. For FISH analysis, lymphocyte metaphase spreads were hybridised with seven probes defining the loci/region including GATA3 at distal 10p (table 3), together with a 10q telomere probe (2136c3/cosmid)16 used as an internal signal control. The 554F11/BAC probe was shown to contain all the six exons of GATA3 by polymerase chain reaction (PCR) analysis (data not shown). The 10q telomere probe was labelled with biotin and detected by avidin conjugated to fluorescein, and the remaining probes were labelled with digoxigenin and detected by rhodamine anti-digoxigenin. For microsatellite analysis, leucocyte genomic DNA was amplified by PCR with fluorescently labelled forward primers and unlabelled reverse primers defining 12 loci on distal 10p (table 3), and the PCR products were determined for the fragment size on ABI PRISM 310 autosequencer using GeneScan software (Applied Biosystems, Foster City, USA). The resources of FISH probes and microsatellite primers are shown in the legend to table 3. The genetic distance of the loci examined from the 10p telomere is described in table 3, and the 10p genetic map is shown in fig 2A. Molecular studies of the GATA3 gene. (A) FISH and microsatellite analyses of 10p loci/regions around GATA3. The genetic map of GATA3 (indicated by a square box) and 12 microsatellite loci is primarily based on the chromosome 10 linkage map of the Marshfield Clinic (http://research.marshfieldclinic.org/genetics/). The genetic distance from the 10p telomere is shown in cM (see also table 3). The FISH probes 2189b6/cosmid,16 809F09/YAC, 554F11/BAC, 42I17/BAC, 182F10/BAC, 249K20/PAC, and 765A04/YAC contain 10p telomere region, D10S552, GATA3, D10S1779, D10S226, D10S1720, and D10S585, respectively. In families A-D, the white and black areas denote the monosomic and disomic regions, respectively, and the striped areas depict the dosage unknown regions where the breakpoints should exist. (B) Sequence analysis of GATA3. The GATA3 gene consists of six exons and contains two transactivating domains (TA1 and TA2) and two zinc finger domains (ZF1 and ZF2). The black segments indicate the coding region. The primer positions are shown by arrows. Case E/III.1 is heterozygous for a missense mutation at exon 4 (T823A) which creates a DdeI site, and DdeI digestion of the PCR products has produced four fragments (237 bp, 165 bp, 72 bp, and 59 bp) in case E/III.1 and two fragments (237 bp and 59 bp) in normal controls (N1 and N2). Case F/II.2 is heterozygous for an unusual mutation at exon 4 (900insAA plus 901insCCT, or C901AACCCT) which destroys a MnlI site, and MnlI digestion of the PCR products has yielded four fragments (171 bp, 130 bp, 91 bp, and 75 bp) in affected family members (cases F/I.1, F/II.2, and F/III.1) and three fragments (130 bp, 91 bp, and 75 bp) in clinically normal family members (cases F/I.2, F/II.3, and F/II.4) and a normal control (N). Case G/II.2 is heterozygous for a nonsense mutation at exon 6 (C1099T) which creates an AlwNI site, and AlwNI digestion of the PCR product has produced three fragments (442 bp, 290 bp, and 152 bp) in affected members (cases G/II.2 and G/III.2) and a single fragment (442 bp) in clinically normal family members (cases G/I.1, G/I.2, and G/III.1) and a normal control (N). Wt: wild type allele specific band; M: mutant allele specific band; C: band common to wild type and mutant alleles. The GATA3 gene was examined for mutations by direct sequencing for both strands on the autosequencer. In brief, leucocyte genomic DNA was amplified by PCR for the six exons and flanking intron sequences with the nine sets of primers reported by Van Eschet al 10 (University of Leuven,http://www.kuleuven.ac.be/med/molonc/HDR.htm). 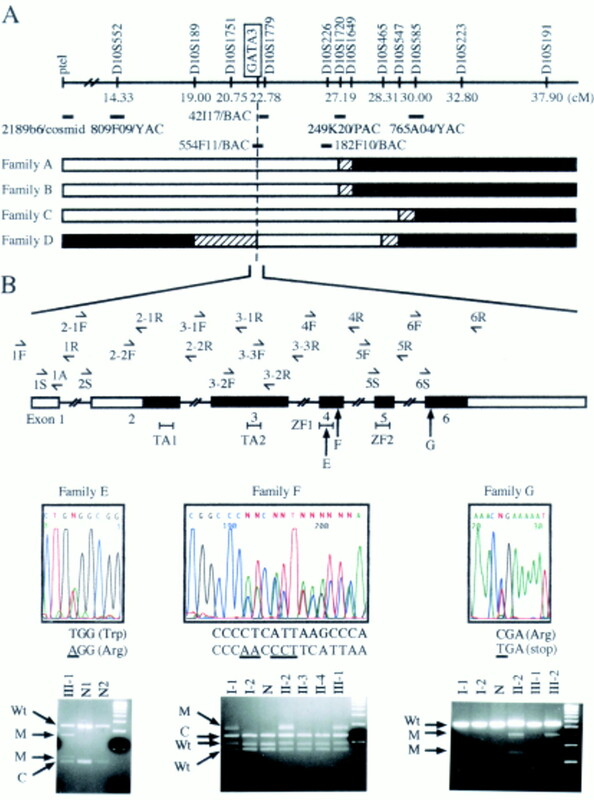 Subsequently, the PCR products were purified and subjected to cycle sequencing reaction with the same nine sets of primers and the following five new primers: 1S, ATACTGAGAGAGGGAGAGAGAG; 1A, TCACCAGTACCA ACCTGGGT; 2S, GCTCATCCAGGTCT CCCATT; 5S, CAAGCCTGTCTTCATA GTGATGACA; and 6S, GATTAACAGACCCCTGACTATGAAG. The primer positions are shown in fig 2B. Furthermore, to confirm mutations, PCR products with the mutations were digested with appropriate restriction enzymes. The probands of families A-D had non-mosaic chromosomal aberrations involving 10p, as described in fig 1. The father of family A (case A/I.1) had a reciprocal 10p;18p translocation. The remaining subjects had normal karyotypes. The results of FISH and microsatellite analyses in families A-D are summarised in table 3 and the deletion maps are shown in fig 2A. 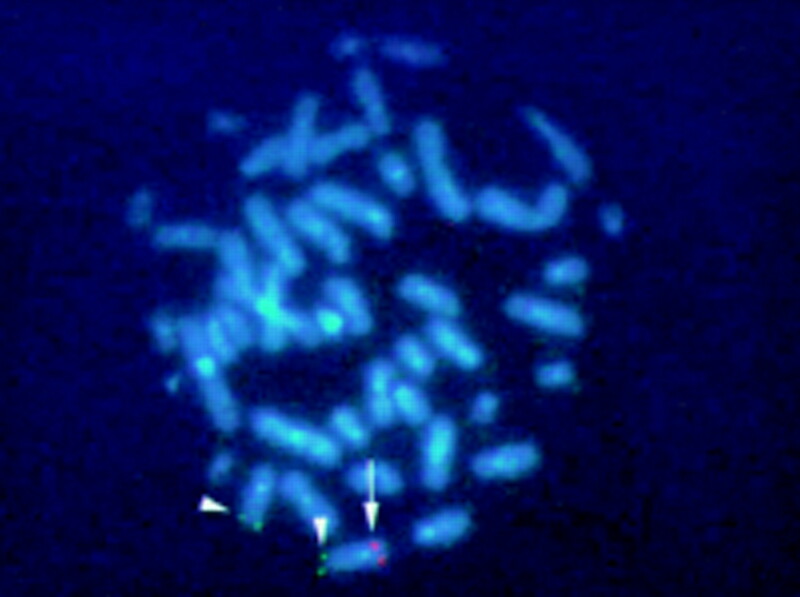 GATA3 was present in a single copy on the normal chromosome 10 alone and was absent from the abnormal chromosome 10 in the probands of families A-D (fig 3). The breakpoint resided between D10S1649 and D10S1720 in cases A/II.1 and B/II.4, between D10S585 and D10S547 in case C/II.1, and between D10S547 and D10S465 and between D10S189 and GATA3 in case D/II.1. The deleted chromosome 10 was determined to be of paternal origin in families A, C, and D, and of maternal origin in family B. In case A/I.1, GATA3 was detected on the normal chromosome 10 and on the derivative chromosome 18, confirming the reciprocal translocation. In the remaining subjects, GATA3 was shown to be present in two copies by FISH analysis. FISH analysis in case D/II.1. Only one single signal is detected for the GATA3 gene (arrow), whereas two signals are found for the 10q telomere (arrowheads). The results are summarised in fig 2B. Case E/III.1 had a heterozygous missense mutation within the ZF1 domain at exon 4 (T823A, W275R), case F/II.2 had a heterozygous unusual mutation at exon 4 (900insAA plus 901insCCT or C901AACCCT) resulting in a premature stop at codon 357 with loss of the ZF2 domain, and case G/II.2 had a heterozygous nonsense mutation at exon 6 (C1099T, R367X). These mutations were absent in 100 alleles of normal subjects. The mutation in case E/III.1 should create a DdeI site and this was confirmed by DdeI digestion of the PCR product for exon 4. The mutation in case F/II.2 was detected in the affected family members and undetected in the clinically normal family members by sequencing; furthermore, the mutation should destroy a MnlI site and this was shown byMnlI digestion of the PCR product for exon 4. The mutation of case G/II.2 was detected in the affected family member and undetected in the clinically normal family members by sequencing; furthermore, the mutation should create anAlwNI site and this was shown byAlwNI digestion of the PCR product for exon 6. By contrast, no mutations were identified in cases H/II.1 and cases I/III.1, I/II.8, and I/II.9. In addition, a G/A polymorphism was found at the 119th nucleotide in the non-coding region of exon 2; the genotype was G/A in cases E/III.1 and G/II.2, A/A in cases F/II.2 and H/II.1, and G/G in case I/III.1. In family I, in which no mutation was identified, the clinically normal parents also had the G/G genotype. This variation was also detected in normal Japanese subjects with a frequency of 40% for G and 60% for A. 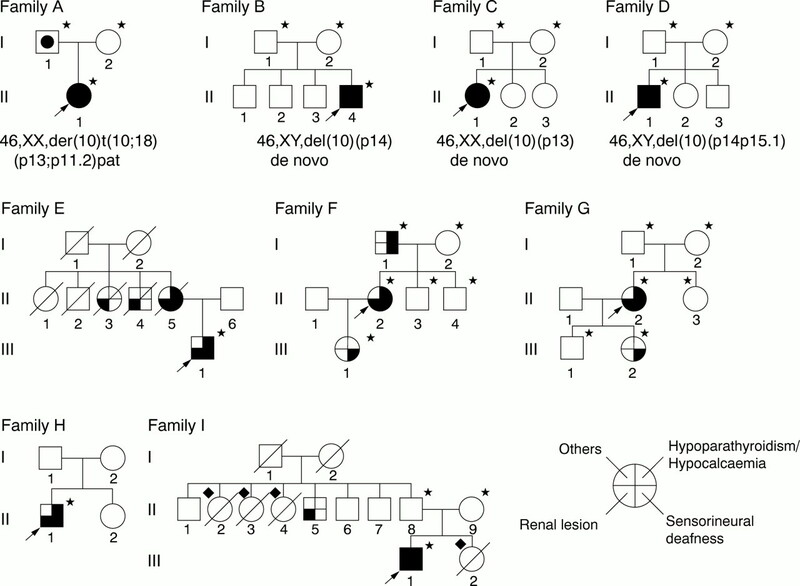 In the present study, heterozygous GATA3 abnormalities were identified in seven of the nine families examined. Whole GATA3 deletions were found in families A-D, and three novel intragenic mutations including two mutations leading to premature terminations were found in families E-G. In this regard, despite the absence in 100 alleles of normal subjects, the possibility that the T823A (W275R) substitution in case E/III.1 might be a rare polymorphism cannot be excluded formally, because functional studies have not been performed. However, the tryptophan at codon 275 is located within the ZF1 domain and is highly conserved in other GATA family members and in mouse GATA3 (GeneBank, http://www2.ncbi.nlm.nih.gov/Genbank/), suggesting the biological importance of this residue. Thus, the T823A (W275R) substitution is considered to be a true mutation rather than a rare polymorphism. The results, in conjunction with those reported by Van Esch et al,10 imply that HDR syndrome is primarily caused by haploinsufficiency of GATA3. The triad of HDR syndrome was variably exhibited by patients with GATA3 haploinsufficiency. For example, cases B/II.4 and C/II.1 had severe manifestations of each feature of the triad, case A/II.1 had a combination of severe hearing defect, mild renal lesion, and transient hypocalcaemia, and cases F/III.1 and G/III.2 showed delayed verbal development as the sole possible HDR feature. Such phenotypic variability is not specific to GATA3 haploinsufficiency. It is known that haploinsufficiency of genes involved in human development frequently shows a wide range of penetrance and expressivity, depending on other genetic and environmental factors.17 Furthermore, although urinary anomalies were diverse, this would not be inconsistent with a single gene mutation. For example, mutations of the angiotensin type 2 receptor gene have been shown to result in variable patterns of urinary anomalies, because of delayed apoptosis of undifferentiated mesenchymal cells surrounding the Wolffian duct and ureter during renal and urinary tract development.18 Thus, clinical diversity in the HDR triad appears to be consistent with this syndrome being a developmental disorder. In addition, lack of appropriate investigations in several patients and probable phenotypic change with age could also account for phenotypic variability, because some features may be overlooked without pertinent examination and may remain undetected if not assessed at an appropriate age (for example, case E/II.5 first showed signs of hypoparathyroidism at 72 years of age). Other clinical features were also observed in several patients with GATA3 haploinsufficiency. In this context, the repeated cerebral infarction in case D/II.1 might be related to GATA3 haploinsuffciency, because GATA3 is expressed in CNS.9 By contrast, pyloric stenosis in case B/II.4 and ventricular septal defect in case C/II.1 would be independent of GATA3 haploinsufficiency, because GATA3 is not expressed in stomach or heart. Similarly, non-specific features such as growth failure, mental retardation, and minor anomalies in the probands of families A-D would be the result of chromosomal imbalance rather than GATA3 haploinsufficiency, because such non-specific features have widely been observed in chromosomal abnormalities.19 Thus, with the possible exception of cerebral infarction, there appears to be no recognisable clinical features, other than the HDR triad, that are directly ascribable to GATA3 haploinsufficiency. In this regard, it may be worth pointing out that, despite GATA3 expression in thymus and T lymphocyte lineages,5 9 immune related features were absent in all the patients, and immunological evaluations were grossly normal in three patients with whole GATA3 deletions. This suggests that a single copy of GATA3 is usually sufficient to maintain cellular immune function. GATA3 abnormalities were not detected in families H and I. Van Eschet al 10 have also failed to identify GATA3 abnormalities in two of five HDR families with no discernible cytogenetic abnormalities. In the present study, case H/II.1 had typical features of HDR syndrome, whereas case I/III.1 showed atypical features such as retinitis pigmentosa and severe growth failure, together with the HDR triad phenotype. Also in family I, clinical features in other family members and their segregation pattern also appear to be atypical of HDR syndrome. At this time, however, it remains to be clarified whether HDR syndrome is a genetically heterogeneous condition, or whether a mutation remains undetected in families H and I, because a partial deletion of the GATA3 gene might have been overlooked and the promoter region and the intron sequences have not been examined. In summary, the present study provides further evidence that GATA3 haploinsufficiency is the major cause of HDR syndrome and indicates that this syndrome is associated with a wide phenotypic spectrum. Further studies in fully or partially affected patients will permit a better definition of the frequency of GATA3 abnormalities and the phenotypic spectrum of HDR syndrome. We are most grateful to the family members who participated in this study. We also thank Professor David Ledbetter for the telomere probes, Mr Masakazu Saito (MBC Inc) for technical assistance, Drs Hirofumi Ohashi, Jun-ichi Oki, Yoshio Makita, Shimon Ishida, Toshiyuki Kishi, Takashi Hamajima, Toshihiko Yokota, and Zen-ichiro Kato for providing us with the blood samples and clinical information, and Professor Nobutake Matsuo for his support and encouragement. This work was supported in part by a grant for Paediatric Research from the Ministry of Health and Welfare, and by Pharmacia Fund for Growth & Development Research. (1992) Brief report: autosomal dominant familial hypoparathyroidism, sensorineural deafness, and renal dysplasia. N Engl J Med 327:1069–1074. (1997) HDR syndrome (hypoparathyroidism, sensorineural deafness, renal dysplasia) associated with del(10)(p13). Am J Med Genet 73:416–418. (1998) Deletion mapping on chromosome 10p and definition of a critical region for the second DiGeorge syndrome locus (DGS2). Eur J Hum Genet 6:213–225. (2000) An HDR (hypoparathyroidism, deafness, renal dysplasia) syndrome locus maps distal to the DiGeorge syndrome region on 10p13/14. J Med Genet 37:33–37. (1994) Structure and expression of the human GATA3 gene. Genomics 21:1–6. (1994) Human GATA-3 trans-activation, DNA-binding, and nuclear localization activities are organized into distinct structural domains. Mol Cell Biol 14:2201–2212. (1991) A T-cell specific TCR delta DNA binding protein is a member of the human GATA3 family. EMBO J 10:1809–1816. (1995) The GATA3 gene is expressed during human kidney embryogenesis. Kidney Int 47:1597–1603. (1999) Embryonic expression of the human GATA3 gene. Mech Dev 85:183–187. (2000) GATA3 haplo-insufficiency causes human HDR syndrome. Nature 406:419–422. (1999) Recurrent cerebral infarctions and del(10)(p14p15.1) de novo in HDR (hypoparathyroidism, sensorineural deafness, renal dysplasia) syndrome. Am J Med Genet 86:427–429. (2001) Familial idiopathic hypoparathyroidism, sensorineural deafness and renal dysplasia. Intern Med 40:110–113. (1995) Audiologic measurement. in Audiology: the fundamentals. eds Bess FH, Humes LE (Williams & Wilkins, Baltimore), 2nd ed. pp 105–103. (1993) Manual of laboratory tests in children (in Japanese). (Bunkoudo Press, Tokyo). (1996) Normal biochemical values in Japanese children (in Japanese). (Sanko Press, Tokyo). (1996) A complete set of human telomeric probes and their clinical application. Nat Genet 14:86–89. (1994) Human haploinsufficiency - one for sorrow, two for joy. Nat Genet 7:5–7. (1999) Role of the angiotensin type 2 receptor gene in congenital anomalies of the kidney and urinary tract, CAKUT, of mice and men. Mol Cell 3:1–10. (1982) Developmental and other pathologic changes in syndromes caused by chromosome abnormalities. Perspect Pediatr Pathol 7:1–63.